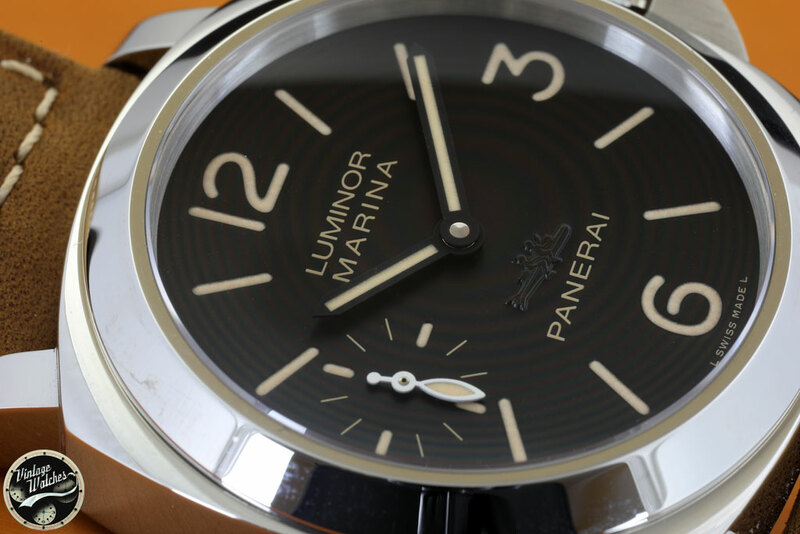 Panerai celebrates its expansion into North America with a special edition Luminor Marina watch at its new Bal Harbour Boutique ‘Miami’. 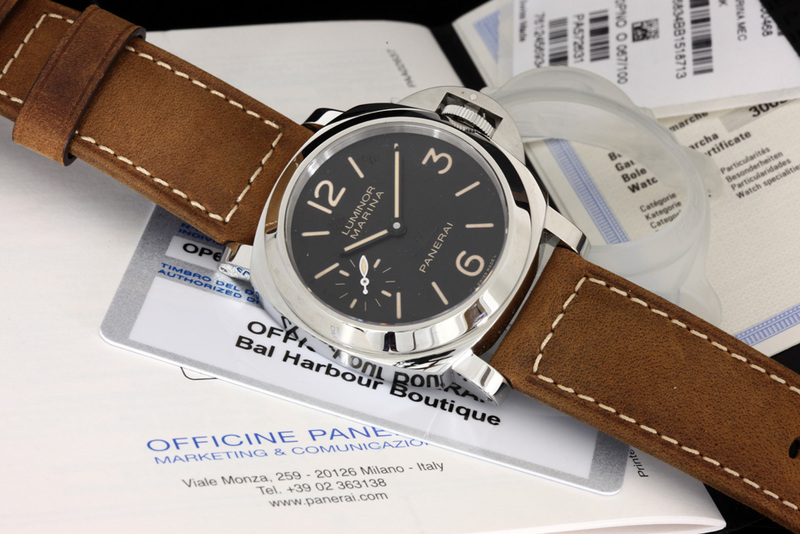 That’s right Officine Panerai is celebrating its first boutique openings in North America, and when it come to timing, it is after all everything. 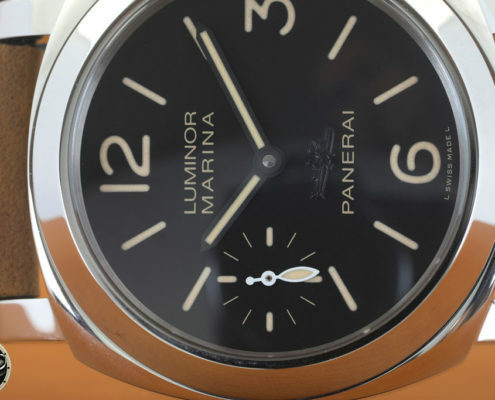 The Italian luxury watchmaker timed the Bal Harbour boutique opening during the Art Basel Miami Beach event – one of the most celebrated weeks of the city’s season. 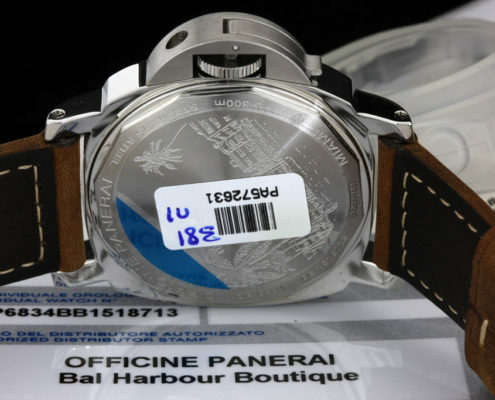 Officine Panerai in celebration of art designed a special edition watch to commemorate the boutique’s opening in Bal Habour, PAM 468 Luminor Marina. 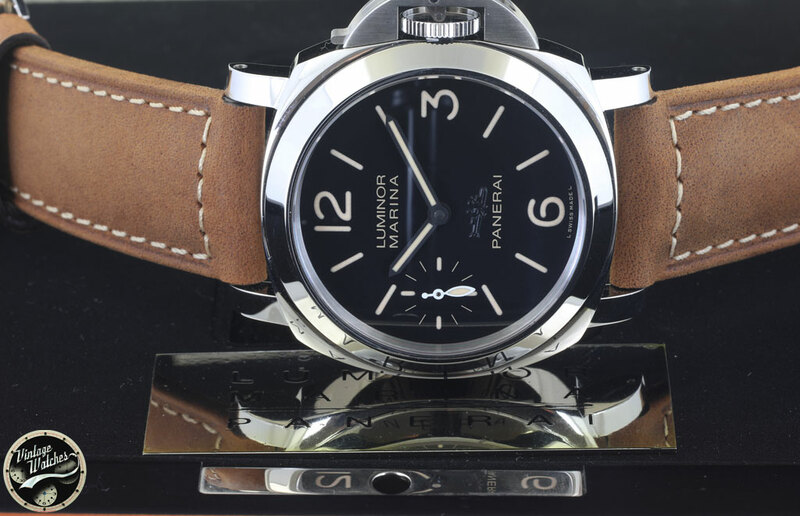 The Pam 468 Luminor Marina Bal Harbour is not only a special edition, but a limited edition timepiece of 100 pieces. 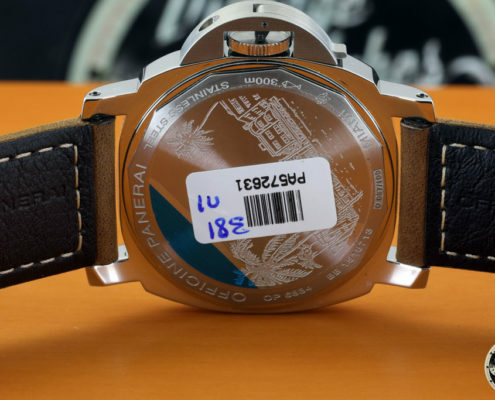 Exclusively made for the Bal Halbour Boutique “Miami” it sports a 44 mm stainless case with an engraved case-back that reveals a breathe taking skyline view of beautiful palm trees along South Beach Miami Ocean Drive. 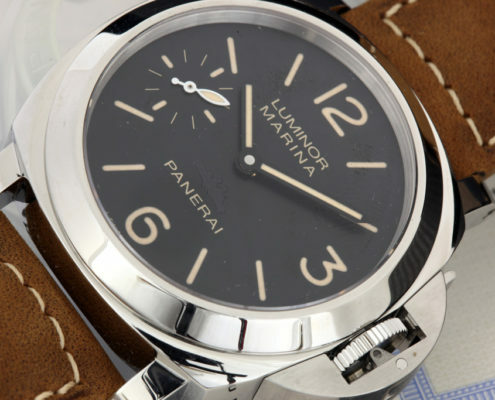 You may want to lower your car’s top to appreciate the full effect of this timepiece (letting your hair down is of course optional). 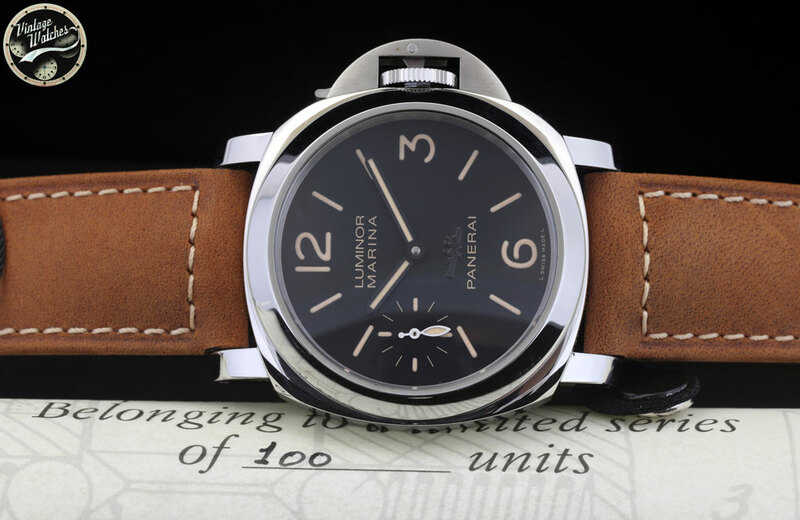 PAM 468 Luminor Marina watch features the Panerais’signature polished steel sandwich style case with brushed steel crown protector. 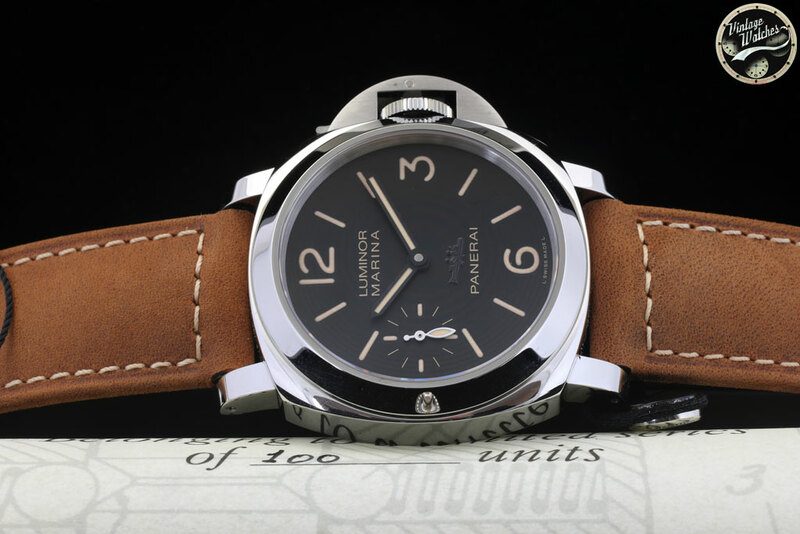 It sports a deep rich brown dial with aged luminescence on the hour markers, minute, hour and seconds hands. 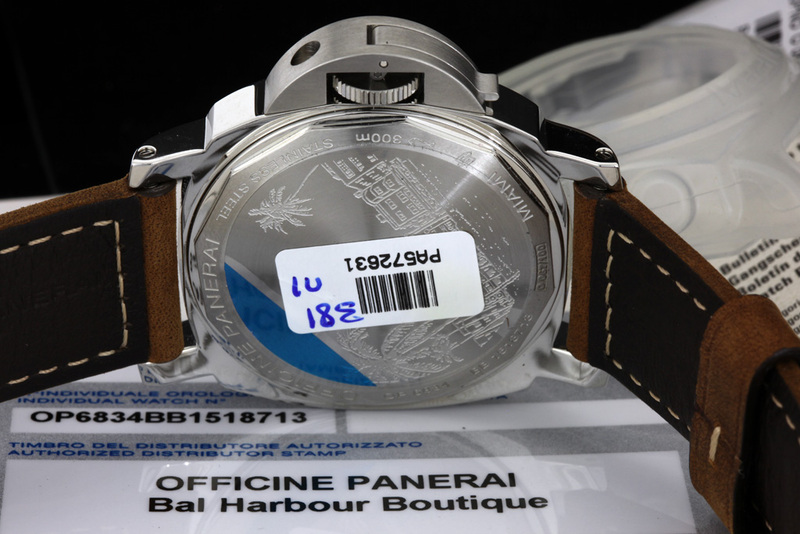 It is adorned with Panerais’ signature distressed brown leather strap and stainless steel tang buckle. 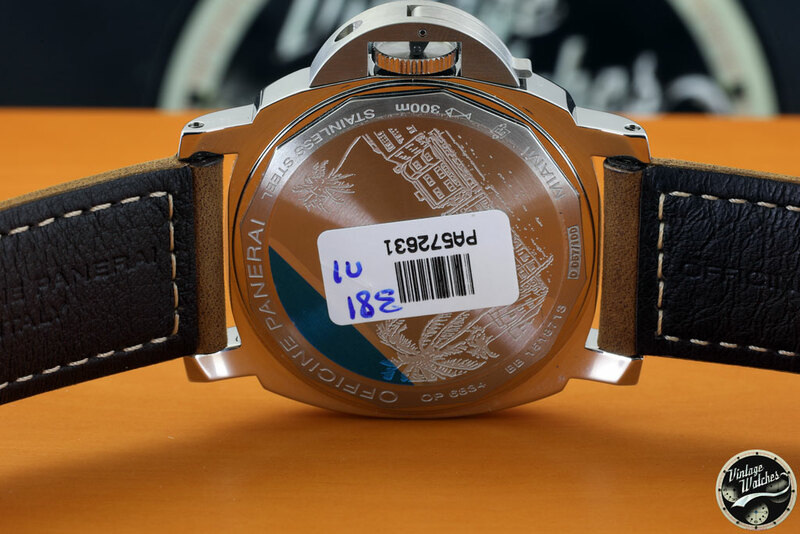 This timepiece is Miami personified perfectly captured by its rich engraved case-back. 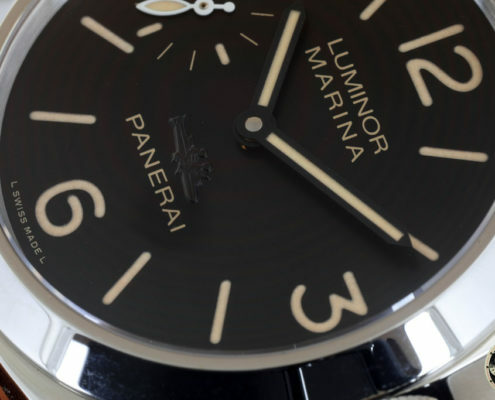 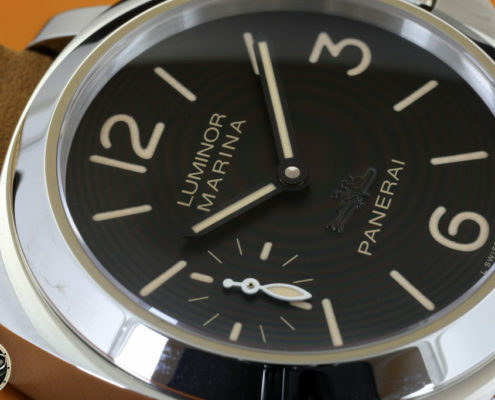 Officine Panerai Bal Harbour Boutique is sure to draw fashionable collector of the Luminor Marina watch in by the droves, especially those wanting to acquire the Limited Edition PAM 468 Luminor Marina Bal Harbour timepiece. 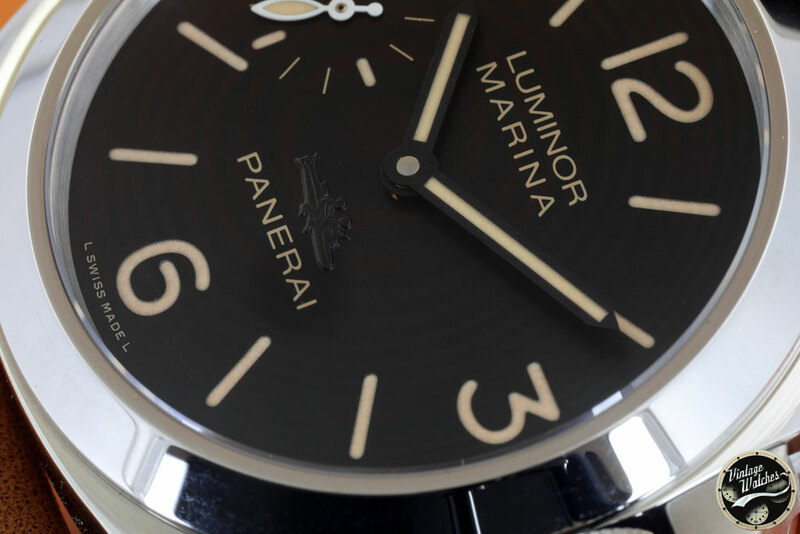 It captures the spirit of the Italian watchmaker’s artistry and the artistic soul of Miami. 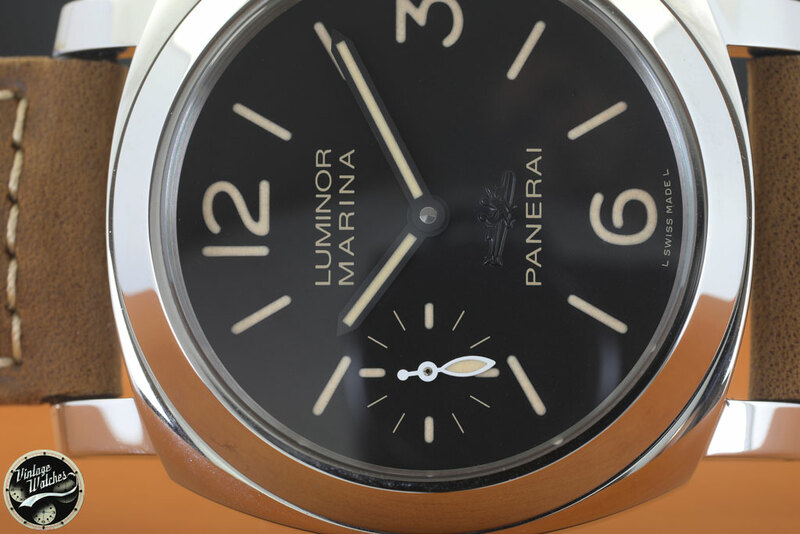 It is a masterful timepiece, but at a limited edition of 100 pieces the heat is on – Miami collectible heat that is. 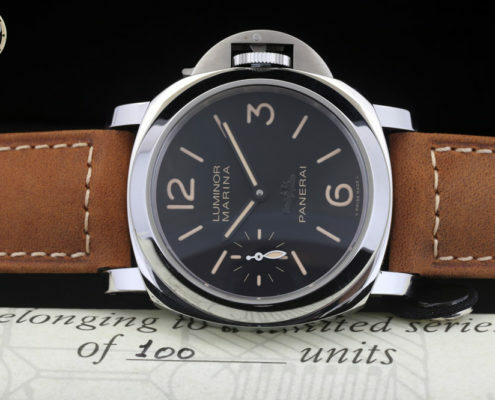 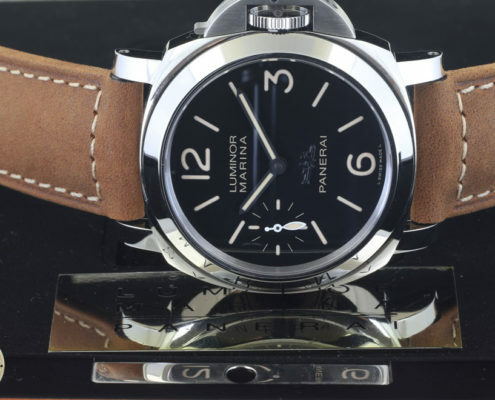 Panerai celebra l’apertura della sua boutique a Miami con questa edizione speciale. 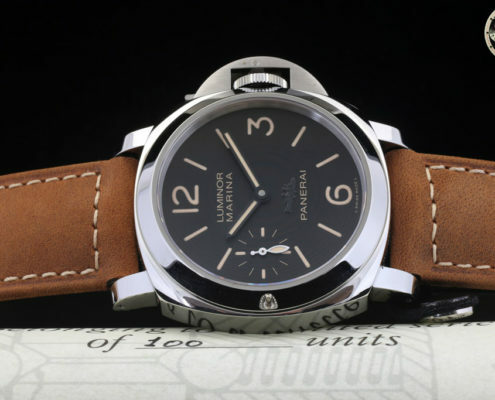 L’orologio differisce dalle serie precedenti per la nuova colorazione beige degli indici e per il fondello personalizzato. 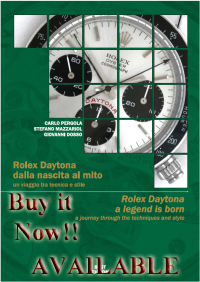 Edizione loimitata di 100 pezzi. 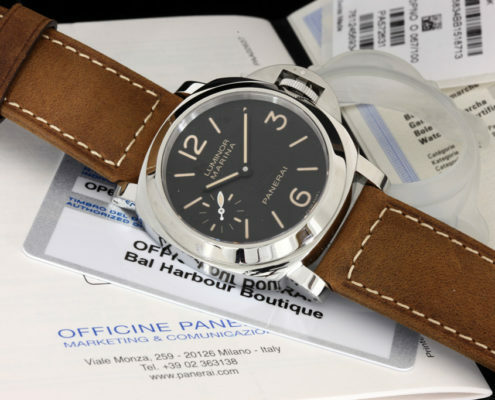 Quadrante personalizzato con sottomarino SLC in rilievo. 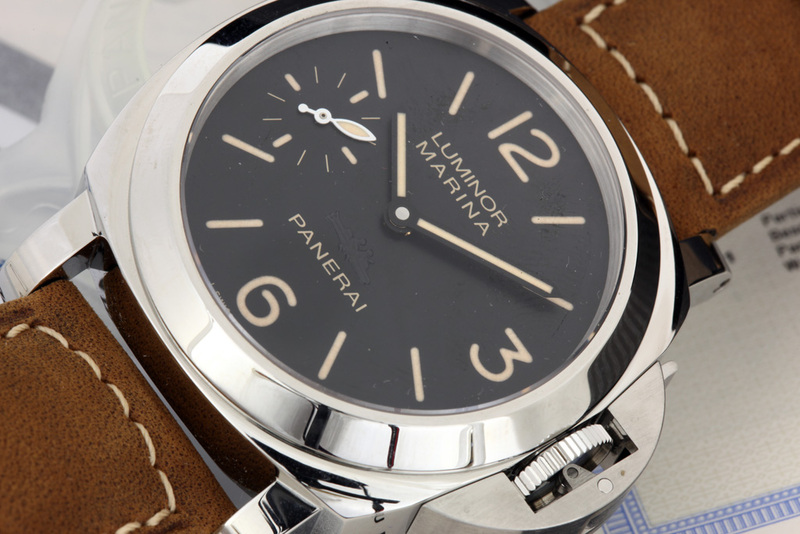 L’orologio è corredato Full Set : scatola speciale, pergamena, cacciavite e garanzia.